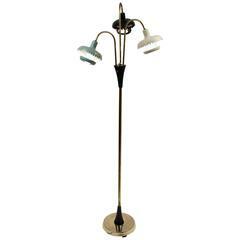 An articulated floor lamp sculptural Mid-Century Modern shades and arms adjust France early 1950s. 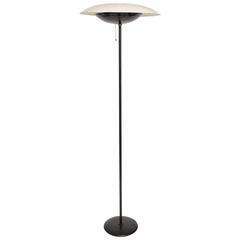 Reggiani articulated floor lamp Mid-Century Modern enameled and chrome-plated steel shade adjusts held in place by a magnet height of shade adjusts colorful contrast very graphic. 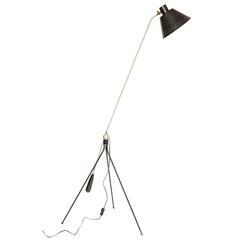 Swiss floor lamp manufactured in the 1950s. New parchment lamp shade attached to three pillars made of solid walnut wood. Generates a pleasant and warm atmosphere. 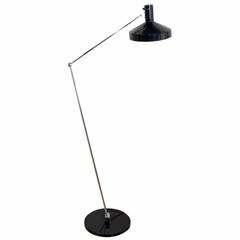 1950's floor lamp by Rosemarie & Rico Baltensweiler, Switzerland. Very versatile lamp. Adjustments at 3 points, floor, mid lamp and at the shade. 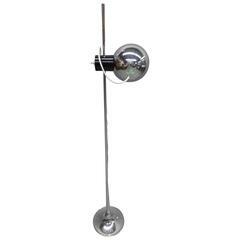 Unique Mid-Century Modern A-frame floor lamp with slider dimmer floor tap switch.